There are a few different reasons why you would need to replace the power cord on your Kenmore dryer. Perhaps the cord has gone bad, or maybe you need to switch an old plug with a new one. At any rate, you have decided to undergo the task of replacing the power cord on your own to save the money that would be spent on paying a technician to do it. When you follow the instructions below, you will find that replacing a dryer cord is not as difficult as it sounds. Purchase a 3-prong dryer power cord. You can find the one you need at your local hardware store, or online at the website listed under "additional resources" below. Unplug the existing cord from the wall if you haven't done so already. Move the dryer away from the wall so that you have easy access to the back panels. Remove the access panel cover. Different dryer models use different types of screws, so you will need to use the screwdrivers or the socket set/wrench set. The access panel cover is located close to where the plug wire meets the entry hole coming from the back. Remove the bolts that are holding the now-visible wires in place, taking extra care not to drop them down the back of the dryer. There will be three wires: one black, one white, and one that's either red, orange or green. Each model will have a different color for the third wire. Typically, the third wire is red or orange and there will be a green grounding wire that will also need to be removed in the same manner. 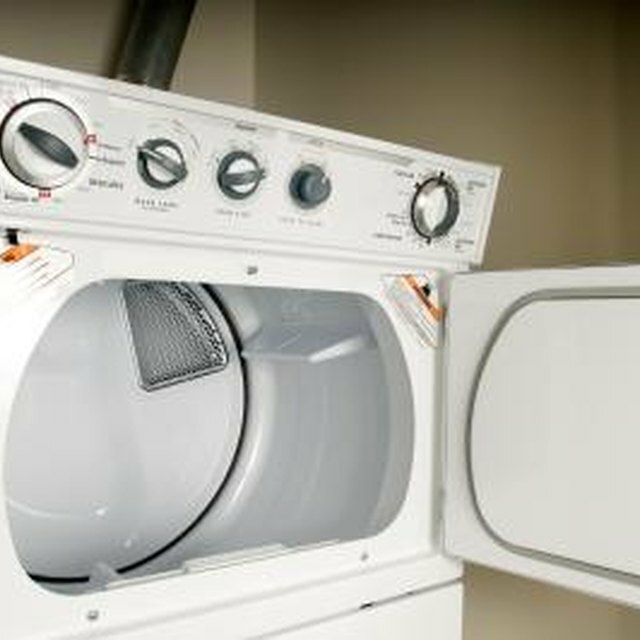 You need to pay close attention to which wires were hooked to each terminal, unless the dryer's inner wires are visible and colored the same as the power cord's wires, and where the grounding wire was attached to the dryer. Pull out the power cord from the hole. Remove the metal clamp connector that is on the cord by unscrewing the two screws. Some models will require you to remove this clamp before you can pull the power cord out because there is an extra support lip that fits inside the hole. Attach the connector to the new power cord. You may find it helpful to screw the two pieces back together loosely and then slide the cord through. Tighten the screws so that the connector fits snugly but not so tight it pinches. Slide the exposed wires through the power cord hole. Attach the colored wires in the same position as the old cord's wires. If the inner dryer wires are visible, all you have to do is match color with color. Tighten the bolts as you attach each wire. Attach the grounding wire of the new power cord in the same place where the old cord grounding wire was located. Make sure this screw is tight. Replace the access panel cover and the screws that you removed previously. Before you plug the new power cord into the socket, turn off the breaker that goes to the dryer. This will prevent electrical problems if something wasn't connected correctly, and you won't get electrocuted when you plug it in.